This is my new outlook on fitness. I have been stuck in this awful rut of over thinking what I have and have not been doing. I’ve been dwelling on the negative instead of the positive, and that my friends is no bueno. For so long I’ve been fixated on reaching my goals and doing what I had to do to reach them. Well, you know what? I reached them and I guess I hit that point of not really knowing what to do next. I had nothing to focus on anymore and found myself wandering around, trying to find happiness in what was familiar but not really what I needed anymore. Now, don’t me wrong. I’m not saying I don’t need to work out daily, or that I wouldn’t benefit from it. What I am saying, is that the need and want wasn’t really there anymore. Part of me wanted to see if I could maintain the goals I achieved without the “beast mode” level of fitness I had become accustomed to….and you now what? I did…and it’s a great feeling. From here on out I want to take things day by day. I want to enjoy whats around me and just go with the flow of the mood I’m in. I don’t want to plan every workout in advance. I want to just do what I feel like doing that day. Some people may think that’s crazy and to them I say, to each their own. I will have my guidelines for the 3 days a week I plan on working out and I will just pick from the workout DVD collections I have to fill the needs of that day. Some days it might be P90X or Insanity, others running or yoga. At this point of my journey I believe my nutrition is the most important part, and it’s the area I have gained the most progress in. To me, it was the hardest to get under control and while I will indulge in kettle chips, Five Guys and ice cream from time to time, I am no where near, nor could I ever return to the fast food fiend I once was. 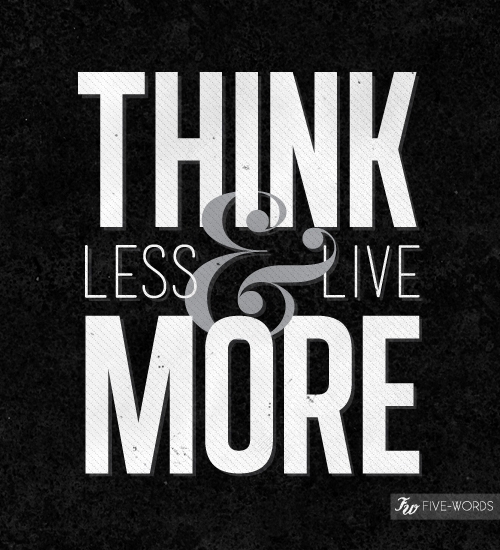 So…from here on out, I vow to (over) think less & live more, because if I can’t enjoy the goals I have obtained, what’s the point? You are making some great points about life on weight maintenance. It’s not just about watching the calories and working out anymore. I like how I’ve heard it said on the Fat 2 Fit Radio podcast: “Live [and eat] like the thin person you want to be.” Now that you’re there, you can expand your horizons a little bit, with the foundation of health and fitness. I will remind you that Tony Horton says in “Bring It!” that he often comes to his workouts without a specific plan except for “Today is cardio” for example. As long as you are careful to avoid injuries while you change from one activity to the other, it’s a good way to stay motivated. Great comment, Fred! That is exactly how I’m approaching things now. The important part is that I maintain the healthy lifestyle and keep moving. I really should blow the dust off “Bring It!” and skim thru it again. Thanks for reminding me about and always keeping me positive. Maintaining good health isn’t about working out as hard a possible (although that’s not a bag things). There are many avenues to maintain and live and enjoy life. Kudos to you for shedding the guilt of feeling like you HAVE to follow a strict plan. If all else fails and your habits waver….you know what to do!